The location was excellent, the room had everything we could possibly need and the staff was friendly and helpful. Really enjoyed staying there. Right next to the apartment there was a quad rental called luca’s. Beach can be reached in 5 minutes and the city of Fira in about 20 minutes. The bus station is away 50 meters. Would come again and again! Everything was amazing. The beautiful lady in the front area was incredibly nice and helpful. Place was pristine, not even a speck of dust and all the staff were incredibly friendly. Die Terrasse mit whirlpool war toll. Zutaten fürs Frühstück wurden jeden Morgen im Kühlschrank aufgefüllt. Die Appartments sind sehr schön eingerichtet. Alles war sehr sauber. Nuevo y muy limpio. La mujer de recepción encantadora y habla español. Me encantó el baño. Con una ducha enorme y amenities de calidad. Terraza muy espaciosa con bañera de hidromasaje. Y el desayuno que reponian cada día en nuestra cocina era muy abundante. Tutto perfetto . Siamo stati io e il mio ragazzo una settimana nella camera 106 al secondo piano , l’appartamento era perfetto e molto grande , la vasca idromassaggio era in terrazzo , un po’ più piccola rispetto alle altre vasche dei piani inferiori ma al contrario del nostro appartamento quelli inferiori erano più piccoli , comunque nella nostra vasca ci stavamo molto bene 2 di noi . La pulizia è stata impeccabile , il cambio asciugamani tutti i giorni, sono molto soddisfatta perché c’erano piccole attenzioni di sistemazione che facevano piacere . Colazione , cibo e bevande se consumati verrá tutto riassortito senza nessun costo aggiuntivo . La posizione anche é Ottima al centro di Perissa molti ristoranti e bar , c’è anche il lungomare con altri bar e ristoranti, e la spiaggia è la migliore di tutta l’isola . Voto 10. Netflix, le jacuzzi, la douche, la situation géographique. La casa è bellissima, pulita e ben strutturata. Appena siamo arrivati, nonostante erano le 22, ci ha spiegato nei dettagli ogni cosa. Nella casa c’era praticamente tutto: mangiare per la colazione, il frigo era pieno, e asciugamani per la jacuzzi, che era stupenda😍 Lo staff era gentile e cordiale, ti aiutano in tutto. Da ritornarci assolutamente! Superbe suite à quelques pas de la plage de Perissa. Idéal pour un couple car il dispose d’un jacuzzi. La vue n’est certes pas exceptionnel mais elle offre quand même un panorama sur les montagnes de l’île. Il est dans le petit village de Perissa connu pour ces plages et son calme loin de la folie de Fira ou Oia. La maison était propre et l’équipe qui dirige à l’écoute de nos besoins. Lock in a great price for De_naxia Suites – rated 9.2 by recent guests! One of our best sellers in Perissa! 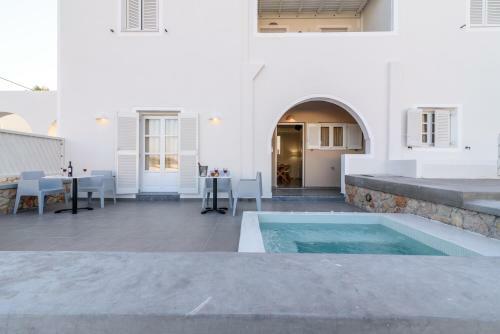 Offering a hot tub, De_naxia Suites is set in Perissa. The famous Black Beach is just 1,500 feet away. Ancient Thera is 0.9 mi away. Featuring a terrace, all units include a seating and dining area. There is also a fully-equipped kitchen, fitted with an oven. A toaster and coffee machine are also featured. Every unit is equipped with a private bathroom with bathrobes. Towels and bed linen are provided. Santorini Water Park is 650 feet from De_naxia Suites, while Perissa Beach is 1,300 feet from the property. Fira, the bustling capital of Santorini, is 7.5 mi. 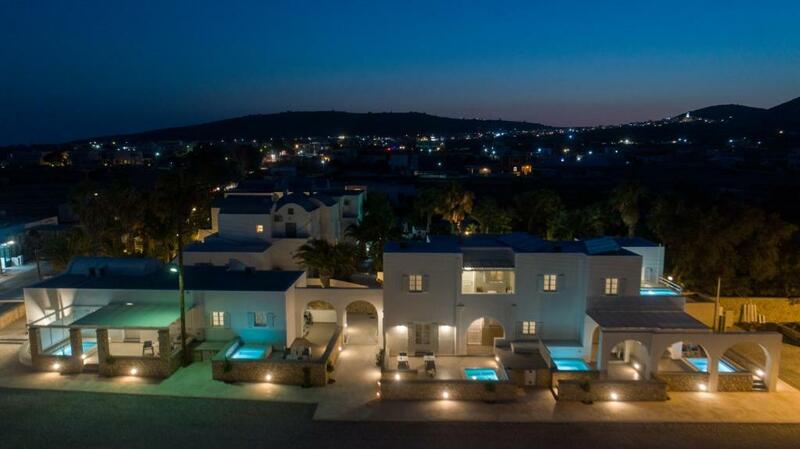 away, while Santorini Airport is a 25-minute drive away. 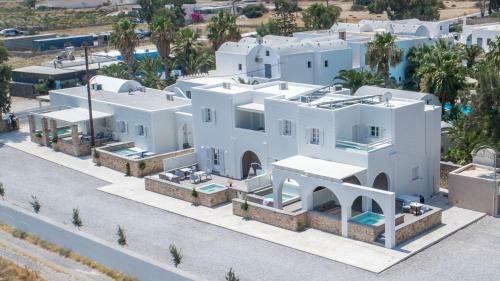 The nearest airport is Santorini (Thira) Airport, 3.1 mi from the property. 뀐 Located in the top-rated area in Perissa, this property has an excellent location score of 8.2! When would you like to stay at De_naxia Suites? This suite has a garden view, hot tub and air conditioning. This suite features a soundproofing, cable TV and tile/marble floor. This suite has a electric kettle, kitchen and bathrobe. This suite features a soundproofing, kitchenware and sofa. House Rules De_naxia Suites takes special requests – add in the next step! De_naxia Suites accepts these cards and reserves the right to temporarily hold an amount prior to arrival. Please inform De_naxia Suites of your expected arrival time in advance. You can use the Special Requests box when booking, or contact the property directly using the contact details in your confirmation.